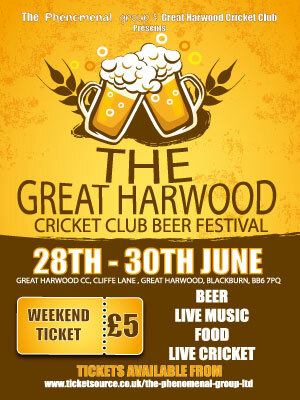 The first ever Beer Festival at Great Harwood CC is happening! The Lancashire League club have a phenomenal weekend in store for the community with a Beer Festival kicking off Friday night when the 1st XI entertain local rivals East Lancashire CC in t20 action, then on the Saturday the 3rd XI are at home during the afternoon before live entertainment and food at night. Sunday if you haven't drank the club dry the 1st XI once again East Lancashire CC this time in league action. The Club committee invites you to come join you for the weekend in warm friendly surroundings.